Last week I had one of those moments you pray for, watch for, and occasionally are blessed to have. My second daughter and I were standing in the kitchen and we were talking about how she has been having problems with her ear holes and didn’t know if she wanted to keep wearing earrings. She had gotten her ears pierced at age 8, because her older sister had done so the year before. You see, this daughter is a major follower. She won’t do anything at home unless she sees one of her sister do it first. Her teacher tells me it’s the same at school. She never initiates any activity. She always waits for other students to begin an assignment, line up for lunch, etc., before she’ll do anything. “I don’t know why I follow my sister,” she said then. This self-reflection of hers was a big one. I could see the wheels turning, and I could tell that she took what I said to heart. She didn’t shrug me off, she wasn’t walking away. She was fully engaged, listening, and actually hearing me. I was in one of those magic teachable moments that don’t come along very often. Since that conversation, I have tried to bring up the topic again at appropriate moments to be sure she was still reflecting on why she’s a follower. I want her to understand that she’s entitled to make decisions for herself, that she knows her true worth. I think I also need to help her to know how to make decisions on her own. Obviously, there’s still a lot of work to be done. So how do we find these teachable moments? I believe it’s through prayer, listening to the Spirit, watching your kids, listening to them, and waiting for openings. I pray daily for help parenting. I know for a fact that I can’t do this parenting thing on my own. And as a single parent, it often feels like I am. But there have been countless instances where an answer was provided to me when I needed it that allowed me to reach a child in a way I could not have done as effectively left to my own devices. Paying attention to our children is key. You need to be keenly aware of what their needs are if are to help them. Watch how they interact with each other. Watch when they do their homework. Are they struggling with something? Is there something you’re missing? Along with watching them, you need to have regular listening opportunities. One of the best times I find to listen is in the car. They don’t realize that when I ask them how school went, I am hoping to hear what their concerns are. They think I’m just making conversation. These conversations often lead to some nugget of information passing to me that I can then store away to be addressed in the future, when one of those openings comes up. And when your kids approach you with something they want to say, put down whatever you’re doing and let them see that they have your full attention. Even if it’s something trivial, really pay attention. They will remember this when they have something important to say. Then you need to watch for openings. If I had been too busy with my phone or something else when my daughter gave me that opening, I would have missed the chance to say some really important things to her. I’m afraid I have probably missed many such openings. I pray that more will come. I trust that they will as I know my Heavenly Father loves me and loves my children and will give me second, third, fourth, indeed endless chances to help them. I think as long as I keep trying, Heavenly Father will keep sending me help. Pray. Watch. Listen. Take the openings when they come. Repeat. Heavenly Father will bless you as you do your best to watch over your little ones. They are His little ones as well. As are you. He cares deeply about how you raise your children. He cares deeply about you. Allow Him to guide you in your most important work on this earth. That was an easy answer for me. I’m a single mom with three school-aged children. When I watched conference with another single mom, we paused the session and immediately and discussed what we would do. My girls always say they hate school. But what did they do on the first day of school when they got home? They set up a schoolroom in the living room and began playing school! I looked at my friend and said “I’m going to set up a ‘school of the prophets’ here in my living room. I’m going to get a white board and we’re going to set up chairs and we’re each going to have our copy of Come Follow Me and the scriptures and every Sunday we’re going to take turns teaching each other. The girls are going to love it!” (I shared my plans with my girls later and they have asked me on more than one occasion when we can get started.) I also bought a white board and set it up just to get them used to the idea. I find them playing school with it on a regular basis already. 1. The children will learn that the home is the central place where they will learn the gospel. 2. They will gain confidence in their public speaking and teaching abilities. 3. They will gain an appreciation for and knowledge of the scriptures and the gospel. Obviously, numbers two and three will help prepare children for their missions. Number four is my hope and maybe pipe dream! Number one is where the church is leading us. For a multitude of reasons, we are being guided to turn our homes into the central place for gospel learning. It is to become our primary ‘holy place,’ before the church building and the temple. So we need to make our homes even more sacred than they are now. Teaching children formally and informally needs to be happening in the home regularly. There are other ways to gather. I have begun gathering singles in my home during the times I don’t have my children. I host Break the Fasts, game nights, and more recently round table discussions for my podcast. (You can find my podcast LDS Unmarried Life at www.annettetalks.com). Every time I gather singles, I come away feeling more camaraderie, unity, and a sense of being a part of a supportive group. I feel like the singles I have come to know through gathering have truly become my sisters and brothers. I know that I can call on any one of them when I need help or a listening ear. I hope they always feel like they can come over, call, text, or reach out in some other way. I love the changes to the block schedule because this means we can truly make our homes a place of learning and gathering, and singles have a huge part in this, whether they have children, or whether they choose to make their home a hub for other singles without children. I’m tired. Last night my oldest child “A” decided (at 9pm) that she needed a great costume for her school tableau today. Her teacher said jeans and a t-shirt would work. But apparently that wasn’t good enough for A. She gets hyper focused on a project and if and when it goes off the rails, so does she. She finally let me put her to bed at 10. Then she heard a noise downstairs around 11. Out of a dead sleep, I had to go down and check it out to reassure her so she could go back to sleep. Midnight. I’m woken up by her trying to sneak into my room, probably because she wanted to sleep with me. Fast forward to 6am today. I wake up because she’s in the hallway outside of my room, again working on her costume. No point in trying to go back to sleep. I lay there and think about last night. Family Home Evening went surprisingly well. The girls liked the activity I planned and actually joined in without whining or leaving the room repeatedly, like they usually do. This was followed by a visit to the park where A tried to teach her younger sister “B,” aged 9, how to ride a bike. B is a developmentally delayed child who is afraid to have anyone let go of the bike. I often wonder if she’ll ever learn to ride. As I lay there, I ponder how A was very sweet at times with B. She came up with little word games and encouraged her. She wasn’t going to give up until B learned to ride. Then when B wanted to give up, A screamed at her. I finally convinced A to back off and let B do her own thing. We went home and I tried, and failed, to loosen a nut on B’s bike so I could put training wheels on it. I’m just not handy, and don’t have the right tools. I made a mental note to text the home teacher (or minister, now, I guess) to see if he could help me with this. I say my prayers, read my scriptures, and envision myself remaining calm during what is usually a storm as the girls get ready for school. A will most likely say something nasty to her sisters or me. One or both of the other girls would most likely not like the fruit I prepared and have a tantrum. B will dawdle getting dressed so she will have to rush through getting her backpack ready. A will refuse to read scriptures. I need to be mentally prepared to handle it appropriately. “I’m calm. I’m zen-like. I can do this,” is my mantra. We get through breakfast without too much difficulty, mainly because A is upstairs having a fit away from the rest of us. She comes down and screams at me as she heads out the door to catch the bus. Her sisters have already left. I’m alone with my thoughts. I’m tired. I feel like a failure. I get dressed and go for my usual morning walk. I walk and pray. “Why do I have this child? I think you sent her to the wrong mom. Why don’t I have a husband to partner with and to have my back when this happens?” My list goes on and on. I cry and plead and whine with Heavenly Father. He’s used to this. It’s my daily morning ritual. After the tears, I can think and walk. As usual, nature and the spirit give me some perspective. I find my sense of humor again. I walk. Slowly, because I’m tired. I stop and text my home teacher (minister) and ask him for help with the bike. He texts back almost immediately, willing to help. Halleluiah! I mean, I could probably go and buy a tool that would work and figure it out myself, but I just get plain sick and tired of always having to do stuff like that myself. Isn’t mowing the lawn and shoveling snow enough? Sheesh. I take a deep breath and try to get a grip again. I keep walking. I mentally go over my to-do check list. I have papers to grade. I need to decide if I want to go to that work conference. I worry about money. Laundry needs to be put away. I haven’t dusted in a while. A’s tableau is at school tonight. How much will she freak out about her costume again before we go? I remember that my sister is coming into town for a few days and I smile. She always knows how to make me laugh. She has difficult kids too. We can joke about them. I walk a bit faster now. I decide that a hot bath and a Target run are in order. And maybe some dark chocolate and diet Coke. The papers will still be there to grade when I get done. I feel a bit better. I reflect on how I’ve heard prophets and apostles refer to their mothers as “angel mothers” and how I can’t relate. I feel more like a weird hybrid. Part angel, part devil, mostly flawed human. Every morning I pray for patience, and every night I pray for forgiveness. I make a lot of mistakes and wonder just how much I’m messing my kids up. Will they grow up traumatized or just damaged enough to need a good therapist? I’m doing my best, I tell myself. And I remember the many priesthood blessings I’ve received over the years. In every single one, Heavenly Father has told me how much He loved me and that he is happy with my efforts. This is my row to hoe. This is my circus and these are my monkeys. I didn’t grow up planning on being a single mom (especially not to a strong-willed child! ), but this is my life. And when I open my eyes and look around (or just go on Facebook) I see that there are many other ladies struggling, working hard, sometimes feeling like they’re failing, but getting up again every day, and doing it all over again. So I raise my diet Coke and my dark chocolate to you, my sister single mothers! You are doing the most difficult, most important job of your life, and you’re doing it on your own (with a little help from your friends)! I salute you, I pray for you, I love you, I understand you. May you remember how completely and totally awesome you are on this Mother’s Day! For those of you that know me, you know that I’ve been trying, and mostly failing, to ‘fix’ a tough kid for quite some time. For many years now, one of my daughters has been calling me names, having major temper tantrums when she doesn’t get her own way, bullying her sisters, hitting me, biting me, occasionally threatening me with a knife, and for a while was telling me she wanted to kill me. The death threats were so frequent that I began thinking about Princess Bride-“I’ll most likely kill you in the morning,” the Dread Pirate Roberts would tell Wesley every night-whenever she would make them. They were mostly amusing because she was pretty young. I don’t think I would have been laughing if she was 16. Like any good (and desperate) parent, I began looking for help. I went to classes about dealing with “strong willed” children. I read books recommended to me by the instructors of the class, books recommended by special ed teachers, and other books that sounded like they would apply to my situation. I started her in counseling. I was in counseling. I finally took her to be psychologically tested. Intermittent Explosive Disorder was what they diagnosed her with. That’s right. IED. Seemed appropriate. After all, she would often go off like an Improvised Explosive Device. So now I had a diagnosis and recommendations. They included family counseling. Already doing that. Getting her into sports or other activities she likes to help her boost her self-esteem. Check. And a few other things I can’t remember off the bat, but I did them all. Things continued to escalate. In case you don’t know, I’m a single mom of three daughters ages 7, 8, and almost 10. Things get a bit hairy around the house on the best of days. When she would ‘explode’ things got downright scary. To give you a picture of what things were like, things would usually heat up in the mornings. For whatever reason “A” (I’ll call her A because all of my girls’ names start with an A) would refuse to get dressed, eat breakfast, or whatever. I would insist. She would yell at me. I would yell back at her. She would then lunge at me or run away and I would chase her down and make her do whatever it was she wasn’t doing. I would inevitably get called a name, a sister would most likely get screamed at, and maybe hit by her, and once I got her out the door for school, I would spend 30 minutes crying or tearing my hair out because of how miserable the morning was. After we started on a second counselor and things were still not improving, I decided to go the medication route. The counselor wholeheartedly agreed. I took A to a Psychiatric Nurse Practitioner. She recommended genetic testing, which we did. It revealed a few things such as the fact that A is kind of opposite of ADHD. She gets hyper focused on things. I can see that because she obsesses about something new about every week. She had a few other things going on that gave the PNP enough info that she was able to give a somewhat tepid recommendation for a medication. I said “Let’s try it!” Anything was welcome at this point. So we started her on a low dose. There were some great responses to my Facebook post. One was to read a book called ‘The Anatomy of Peace’ by The Arbinger Institute. This was a fabulous book that teaches you how to see other people as people and not just impediments. 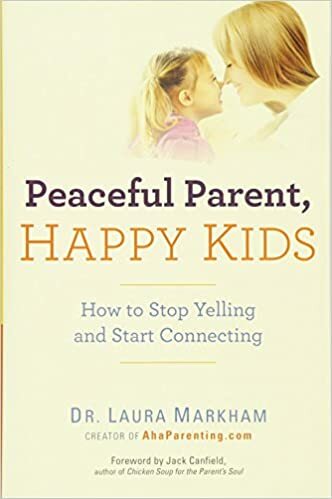 Another friend recommended an article on www.ahaparenting.com entitled ‘Getting Strong-Willed Kids to Cooperate without Punishment.’ There was quite a bit of good information in this article and the author, Dr. Laura Markham, recommended her book ‘Peaceful Parent, Happy Kids,’ for more information. I wanted more information! So I ordered the book. That book was a game changer. I read it and began implementing her recommendations and the drama in the house has gone down significantly! So much so that I backed A off of her medication (which had never been up to a therapeutic dose and so probably wasn’t making a difference) and when I told the PNP what I was doing with A and why, she told me that most parents take years or never get to the point where I was at with my parenting and that I should teach seminars because I explained it so well. I showed her the book. She recommended that we back A off of the medication and see how it goes. She told me that medication is a last ditch effort and that what I was doing was far superior. Yay me! The first C is Calm. Or Regulating Yourself. This means that when we are parenting, we stay calm because we regulate our own emotions. Kids will push our buttons. They are particularly skilled and qualified to do this. As Dr. Markham says, if you have buttons that are being pushed you need to excavate them. You need to develop mindfulness. This means being able to feel an emotion without acting on it. Not only does this allow us to keep things from escalating when kids misbehave, but it also models to our children how to handle their emotions. There is a lot of great specific advice in the book on how to learn to regulate your emotions. Like not taking action when you’re triggered. And nurturing ourselves. We all come into parenting with childhood issues. We need to notice when we’re triggered and why. We need to talk ourselves through those emotions instead of acting on them. As I mentioned, I was being triggered by A calling me names. The book taught me not to take that personally as it had nothing to do with me. It was A’s way of showing that she wasn’t getting some need met. I learned to stay calm when she exploded and to walk away when I couldn’t stay calm. I did a lot of inner work on myself and addressed some old childhood issues that came popping up. I began nurturing myself. The book says, “You deserve all the tenderness you would shower on a newborn baby. Giving that love to ourselves transforms our parenting—and our lives.” In other words, we need to parent ourselves. If we didn’t feel unconditional love growing up, we need to offer that love to ourselves now. Another great point Dr. Markham makes is that every decision we make in life is based on love or fear. We need to make every decision—especially parenting decision—from love. Love for ourselves and love for our kids. The second C is Connection. This means that you are connecting with your child on a meaningful basis daily so that she knows that you love her unconditionally, big emotions and all. The idea behind this is that if your child knows that you adore her and think the world of her, she will want to behave. She will want to please you, emulate you, and be close to you. If you think about it, don’t we all want that? Don’t we all deserve and yearn to have someone that loves us no matter what and believes that we are the greatest thing since sliced bread? One of the best ways to connect with our kids is through what Dr. Markham calls Special Time. This is where you spend 15 minutes of one-on-one time with your child doing what they want to do. You turn off your phone and focus solely on this child. Play is a great way to spend this time. This lets the child know that they are important to you and gives them a chance to express themselves to you. This is a great bonding time and something children hunger for. I started doing this with all three of my girls, though they usually get 10 minutes since there are three of them and time is usually short. Another way to connect is through frequent hugs. My youngest child used to sing “Four hugs a day, that’s the minimum,” in kindergarten. I found out from reading this book that there was a study which showed that people need four hugs a day for survival, eight hugs a day for maintenance, and twelve hugs a day to thrive. So I make sure I am hugging them as often as I can. They love it. And I love it. It’s a win-win. Often when A begins a meltdown, I will grab her and put her on my lap and hug her. This will usually get a positive response. One of the things the book mentions is that when kids ‘misbehave’ it’s because they are not feeling connected to you. The Third C is Coaching, not Controlling. If you’ve ever read any parenting books where they break down parenting style into four types, you’ve heard of Neglectful, Authoritarian, Permissive, and Authoritative. Dr. Markham points out that Authoritative is the best way. Or as she calls it ‘loving guidance.’ This means not trying to make your children behave. That includes not using punishment. It’s a hard concept, but one that totally rings true to me. As your children get bigger, you can no longer pick them up and carry them into timeout. (Unless you want to risk injuring yourself or your kid.) The more you try to punish, the bigger the stick you need. Or if you’re using rewards, the bigger the carrot. Coaching, on the other hand, allows you to set empathetic limits. If you are staying calm and connected, the child will want to behave for you. They are motivated to please you. This motivation comes from the inside rather than from an external force (i.e. you) making them do something. Tears release stress. Seven minutes of crying reduces stress by 40 percent. I can attest to this from my own experience! Usually you can catch your kid early enough to produce giggles, but if they’re too rigid and unable to work with you at all, tears may be the best way to release the built up emotions. Either way, once the child has released the big emotions, they are done with misbehaving and ready to get back on an even keel. This kind of parenting is a lot of work and takes a lot of time, but it is well worth it! After all, parenting is the most important thing we will do in this life. Its effects have eternal ramifications. And they affect the here and now. Not only are we raising children to become healthy, happy, self-fulfilled adults, but we are creating a happy, peaceful home now. I hope you took something away from this and will pick up the book and give this method a try.